Avail Discounts on the Regular-Priced Elecom Products! As we enter the pages of 2016, The Lifestyle Portal and Elecom, Japan's No. 1 electronic products are giving away 10% off discount in all its regular-priced products. The mechanics is so simple! Just show the coupon below in any Elecom brands and mention this website The Lifestyle Portal and you can avail the discount! It doesn’t matter whether you’re a big musicphile or not, everyone pretty much has a favorite song, album or artist that is on constant repeat in his/her playlist. But given that today’s fast-paced world dictates a highly-mobile lifestyle for most, especially the “millennial generation”, people now consider such gadget accessories as part of their everyday must-haves. 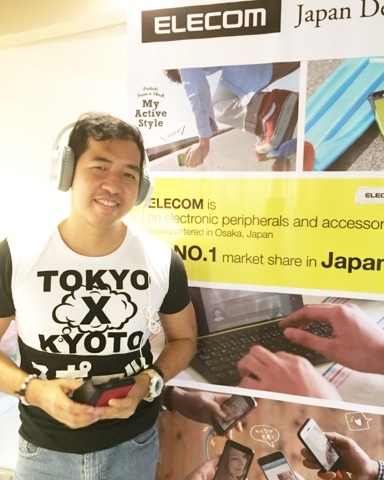 This highly-mobile lifestyle is what Japanese brand, Elecom is actively supporting through its impressive lineup of gadget accessories that range from headphones, portable speakers, portable keyboards, cables, even car accessories. Offering gadget accessories in a wide range of styles and price points, Elecom is definitely a haven for tech and lifestyle accessories that give you more value for money. One of its most popular product offerings are its headphones – available for both in ear and on ear. There are the cute, multi-colored ones that are perfect for students on the go, then there are the more sleek-looking headphones that are best suited for those who expect nothing less than superb sound quality. Supporting this lineup great lineup of earphones is the brand’s selection of portable speakers that range from mono speakers to cool Bluetooth speakers for serious sound tripping no matter where you may be. Make sure to check out Elecom’s full selection of headphones and portable speakers in store and get to enjoy a great shopping experience in one of Japan’s most well-trusted brands for tech and lifestyle accessories.